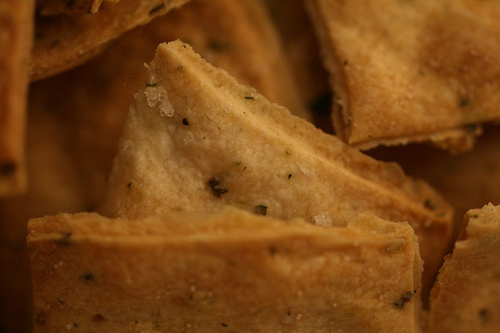 This crisp cracker is free of gluten, dairy, egg and yeast. The dough is rolled and it's very easy to work with. I used Herbs de Provence to season the dough- a combination of thyme, sage, rosemary, basil, lavender, savory, fennel seed, marjoram, tarragon, oregano, and bay leaf- but use your own favorite GF herbs or leave them plain with just salt on top. Use a round or square cookie or biscuit cutter to create uniform-sized crackers. Place dry ingredients in a large bowl. Whisk until well blended. Add olive oil and water and stir until dough forms a ball. If mixture is still crumbly, add water, one teaspoon at a time, until dough forms a ball. Divide the dough in half with a knife. Sprinkle a smooth work surface with a small amount of white rice flour. Sprinkle rice flour on a rolling pin and roll the dough until it is very thin, about 1/16th of an inch thick. Use a 1 1/2 inch round or square biscuit or cookie cutter to cut crackers- or use a knife to cut even squares. Prick top of each cracker twice with a fork. Using a small spatula, transfer crackers to two large, ungreased baking sheets. Sprinkle tops of crackers lightly with salt. Repeat with second half of cracker dough. Bake for 15 minutes. Remove from oven and place crackers on wire racks. Put the wire racks on the baking sheets and return crackers to the oven for an additional 5 to 7 minutes. Cool crackers and store in an airtight container. This dough is crumbly but don't worry- just add water, a teaspoon at a time to keep the dough rollable. Gently roll back and forth on the dough to avoid cracks. Also be gentle when piercing the cracker dough with fork. I take the loose crumbs and continue to roll and cut out crackers until dough is all used. Make flatbread crackers by cutting dough in 5x3 inch rectangles.